eHealth Consortium is pleased to announce a free seminar in 2015 for members and the public, with the aims to boost the awareness of ehealth adoption for improved care delivery. Limited seats available, REGISTER NOW! Voice is used to be the preferred way of collaboration with various parties participating in voice conference to accomplish certain task together. As we all agree that video is more effective than voice alone. Integrating video into healthcare would enhance efficiency and provide new ways of delivering healthcare services. Healthcare industry has adopted video technologies in different areas including remote patient care, collaboration between physicians, operation theater, remote teaching and training for physicians and care providers. Video technologies are also widely used in patients-to-others communications especially during epidemic situation like SARS. 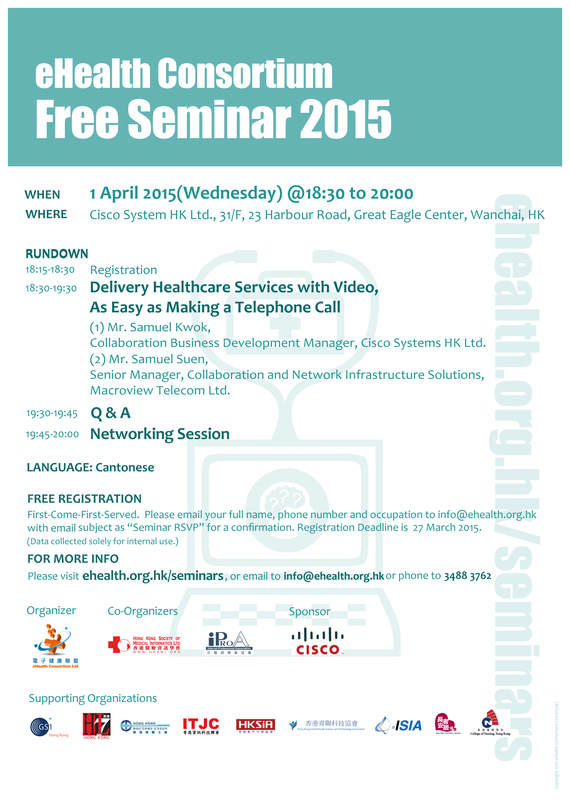 In this seminar, Cisco will discuss video technologies which is used to facilitate collaboration across different platforms and case study on how Cisco collaboration portfolio increase efficiency in healthcare industry. Samuel Kwok is the Business Development Manager of Cisco Collaboration Team responsible for Hong Kong & Macau collaboration business. He possessed great sales & distribution management experience and is a consistent performer who met sales targets in last ten years. With strong relationship with senior executives of key IT vendors and government officials, Samuel accomplished excellent sales track records. He is also familiar with Great China market environment and build a strong channel partners? ecosystem. His knowledge covers a wide range of industries including Product distribution, Consumer market, Healthcare, Manufactory, IT related industries. Samuel is also the team lead for Collaboration Architecture Plays in building new partner landscape all over Greater China and coordinated partners? enablement scheme for more 100# collaboration partners. (2)Samuel Suen, Senior Manager, Collaboration and Network Infrastructure Solutions, Macroview Telecom Limited. Samuel Suen leads a technical consulting team to provide ICT solutions to customers. His team and he are focus on design & service delivery on Enterprise Networking, Unified Communication, Video Conferencing, Contact Centre and Data Centre solutions. With Cisco CCIE R&S (Routing and Switching) and Voice certifications, he has a solid technology knowledge and hands-on experience on Cisco solutions as well. Besides, he helps to drive the Unified Communications and Collaboration business by working with business development and software development teams, so as to prepare and fit the technology solutions to different vertical industries such as retail, hospitality and health care. With more than 15 years of solid experience in data communications and collaboration technologies, Samuel also got the MBA degree and Cisco Business Value Specialist certification. He knows how to turn the technology into business outcomes. Strong capability on correlating customer business initiative to technology architecture, and articulate the unique value obtained by integrating various technologies, capabilities, and solutions to the CxO level. Priority will be given to I.T. Professionals. Seats are limited. First-come, first served. Deadline for registration is 27 March 2015. Please email your full name, phone number,occupation and company name to info@ehealth.org.hk with email subject as ?Seminar RSVP? for a confirmation. Please email to info@ehealth.org.hk or phone at 3488-3762.
eHealth Consortium is pleased to announce a quarterly seminar series in 2015 for members and the public, with the aims to boost the awareness of ehealth adoption for improved care delivery. (Updated on 4 March 2015) Stay tuned for information on our next seminar!